Bed Bug Infestations – How Do You Get Bed Bugs? 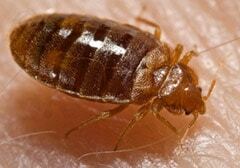 Many people unknowingly act as carriers of bed bugs. They may not realize that they have picked a few up at work and brought them back to their homes and contaminated their belongings. Bed bugs are present almost everywhere – schools, offices, bus stops, malls, restaurants, hotels, gyms, and more. They can also climb onto shoes, purses, backpacks, luggage, and other personal effects. Because they of their small size and toughness, they can effortlessly travel from one point to another by way of wires, gutters, water pipes, tubes, and others. Bed Bug Bites – What Do Bed Bug Bites Look Like? Bed bug bites are the worst. They are painful and uncomfortable. They are those tiny, red spots or welts that can be extremely itchy and swollen for several days or weeks. They can appear on the face, hands, arms, necks, thighs, back, stomach, and any body part that is exposed. Anyone who becomes a victim of bed bugs is advised to avoid scratching the bites. Instead, apply some treatment solutions to them for relief. Usually, certain kinds of lotions and creams, such as calamine and hydrocortisone, are prescribed to reduce the itchiness and swelling. Other times, antihistamines are recommended to deal with more serious allergic reactions. Bed bugs are not choosy at all when it comes to finding a breeding and thriving ground for themselves. Even though cleanliness does not always guarantee a bed-bug-free environment, proper sanitation can at least help lower the risk for an infestation. For instance, carpets are one of the more common bed bug hideouts, so vacuuming these on a regular basis can remove deposited eggs and adults along the carpet edges before they can cause damage. Also, check under bed, chair, and table corners and make sure to vacuum there too. Thoroughly wash garments, bedding, linens, and sheets. Set the washing machine to the highest temperature as bed bugs cannot survive in very hot conditions. Bed bugs die once temperature goes over 120 degrees Fahrenheit. Avoid using potentially contaminated items. Buying used mattresses, clothes, and furniture are generally discouraged unless these things have been meticulously examined and proclaimed bed-bug-free by a bed bug expert. If you are dealing with a bed bug infestation, call us for a free estimate.